Bring some old-fashioned charm to your feeding stations with the Perky-Pet® Milk Pail Feeder. 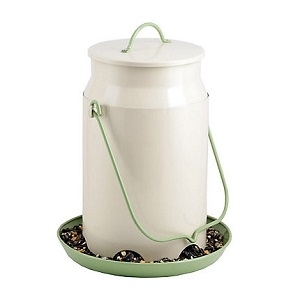 The classic milk canister silhouette and earthy coloring makes this feeder the perfect rustic touch for any backyard setting. This feeder doesn’t just look great – it offers a large capacity, too! The pail is able to hold an astounding 5 lb of mixed seed or sunflower seed to ensure your hungry backyard birds are always well fed.